Image: Courtesy of Michelle Harris. Design: Ashley Britton/SheKnows. My daughter, Mackenzie, is in the first class of girls who have joined the historically all-male Cub Scouts, part of the Boy Scouts of America. And I couldn’t be more thrilled. In fact, Mackenzie joining Cub Scouts has helped bring our family together — and has even made my life easier. Mackenzie's twin brother was already a Cub Scout, so she had already been attending Cub Scout events for a while. She would sit and watch, but heretofore was only permitted to participate in sibling-inclusive events. She would learn all the skills — but she couldn’t earn awards. 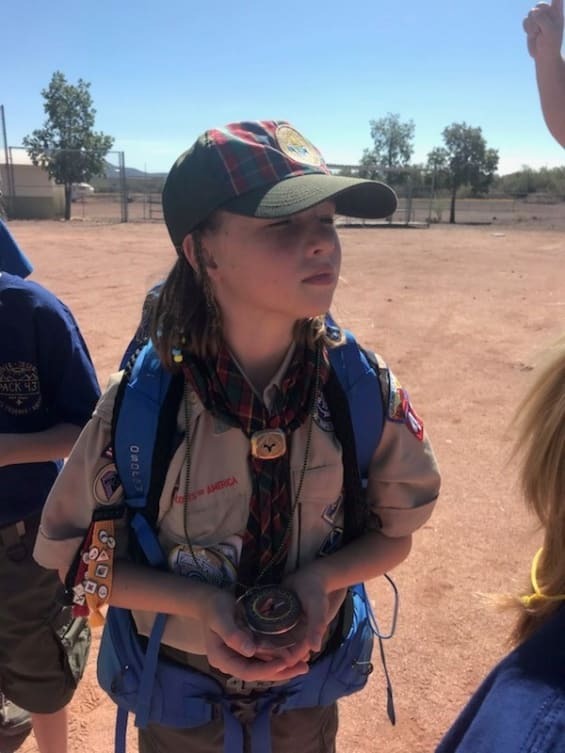 So when the Boy Scouts of America announced after more than a century of being boys-only that they would welcome girls into their program, Mackenzie was thrilled. When Mackenzie's dad and I sat down with her to talk about her potentially joining the Cub Scouts, she was beside herself with excitement. Her first question? Whether she would be able to earn her Whittling Chip so she could go to camp and carry her own pocketknife. 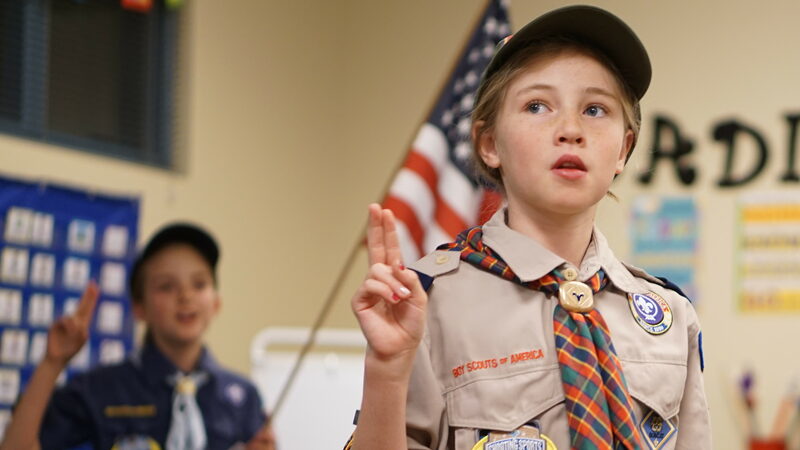 We knew immediately Cub Scouts would be the right choice for her. My daughter joining Cub Scouts means we will all be part of one "pack" — Mackenzie and her brother both. (Cub Scouts is organized into "packs" and "dens" — a "pack" includes kids ages 5 to 10). It's bringing our family together in the most practical, simple way. It also means the Boy Scouts of America gets it. 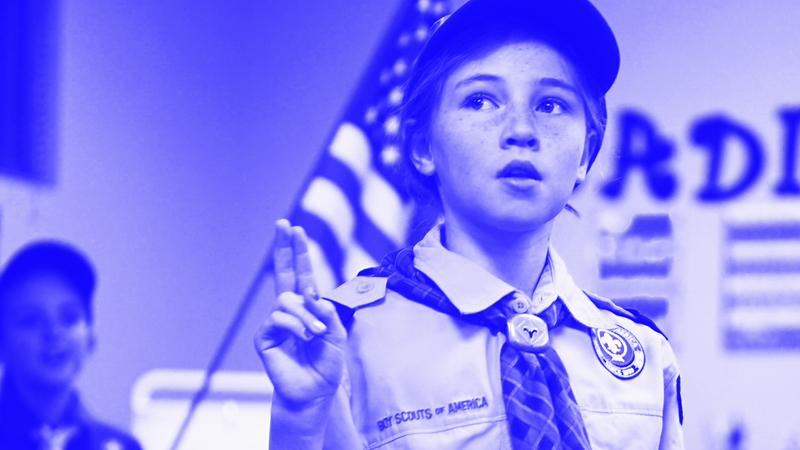 This is an organization that understands girls can do anything — including being a part of Scouting. BSA understands every family is unique and needs options for kids of all genders. And with more than 62,000 girls enrolled in Cub Scouts to date, it's clear that this change didn't only resonate with our family. The Cub Scouts didn't have to invite my daughter into Scouting; from Mackenzie’s perspective, she was already here. I just needed to buy her a uniform and get out of her way. When I first saw my daughter in her new Cub Scout uniform, I thought to myself, “This little girl is going places.” And she was — and is — not alone: Cub Scout girls earned several awards during the program's first co-ed year. When we went to our pack’s crossover event ­­— where Cub Scouts move into the Boy Scouts program (which will be called Scouts BSA starting this February) — my daughter again turned to me and asked, “Will I be able to cross over next year?” I was so excited to tell her that she will. Mackenzie has experienced a lot of firsts in Scouts, and now she has a new goal: She wants to be one of the first female Eagle Scouts in the world. I have every reason to believe she will do just that. The kids in our Scouts pack come from all different backgrounds, but they all chose Scouts — and Scouts welcomes them all by the sheer nature of its inclusivity. Cub Scouts welcomes our whole family — parents, kids, regardless of gender — and invites us to share in adventures with each other. We cheer each other on. We teach each other new things and help out in our community as a family. When I think about the future, I am overwhelmed with joy knowing that long after my twins earn their Eagle, we'll be able to look back and know we did it together — and that their brother-sister twin bond is even stronger because of it. If you would like to learn more about family scouting to find a group to join, please go to BeAScout.org.